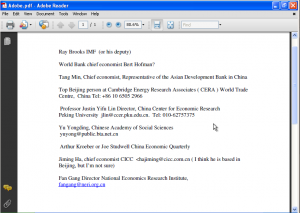 There have been recent reports of malware attacks on journalists based in China. 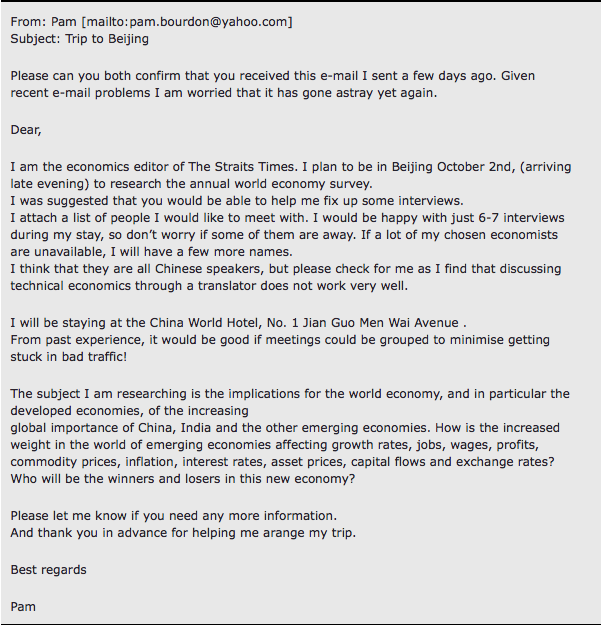 The attacks specifically targeted Chinese employees working for media organizations, including Reuters, the Straits Times, Dow Jones, Agence France Presse, and Ansa.1 These employees received an email from “Pam ” who claimed to be an editor with the Straits Times, that came with a PDF attachment that contains malware. When opened, malicious code in the PDF exploits the Adobe Reader program and drops the malware on the target’s computer. The content of the email, and the accompanying malicious attachment, are in well written English and contain accurate information. 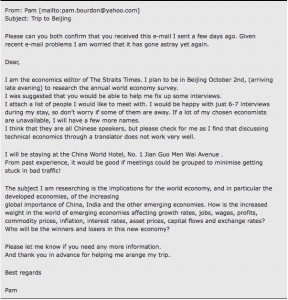 The email details a reporter’s proposed trip to China to write a story on China’s place in the global economy; all the contacts in the malicious attachment are real people that are knowledgeable about or have a professional interest in China’s economy. The domain names used as “command & control” servers for the malware have been used in previous targeted attacks dating back to 2007. The malware domain names, as in previously documented cases, only resolve to real IP addresses for short periods of time. The malware exploits vulnerabilities in the Adobe PDF Reader, and its behaviour matches that of malware used in previous attacks dating back to 2008. This malware was found on computers at the Offices of Tibet in London, and has used political themes in malware attachments in the past. The IP addresses currently used by the malware are assigned to Taiwan. One of the servers is located at the National Central University of Taiwan, and is a server to which students and faculty connect to download anti-virus software. The second is an IP address assigned to the Taiwan Academic Network. These compromised servers present a severe security problem as the attackers may have substituted their malware for anti-virus software used by students, employees, and faculty at the National Central University. 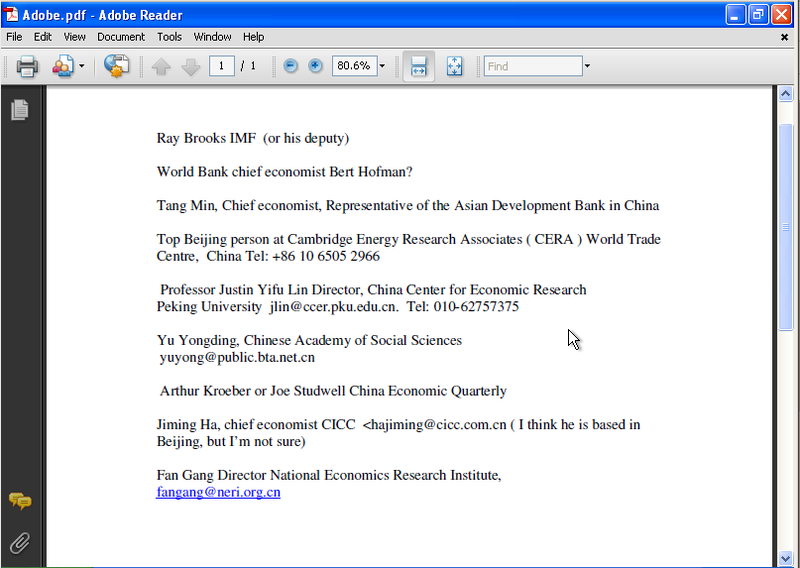 When opened, the PDF displays a list of contacts. The contacts listed in the PDF appear to be genuine. All the names and titles in the document are accurate. However, some appear to be former positions held by the individuals, indicating that the document is somewhat dated. It is possible that this document is a legitimate document stolen from a compromised machine, modified to include malware, and used as a lure to entice people to open the malicious attachment. After opening the attachment, malware is silently dropped on the target’s computer. The domain name zwy2007.pc-officer.com resolves to 210.240.85.250 which is an IP address assigned to the Taiwan Academic Network, Ministry of Education Computer Center. The malware was unable to make successful connections to this IP address. The same DNS techniques were used – the domain names only resolved to real IP addresses for a short period of time. The domain menberservice.3322.org eventually resolved to 140.115.182.230, which reverse resolves to avirus.is.ncu.edu.tw. This location (https://avirus.is.ncu.edu.tw:4343/officescan/console/html/ClientInstall/) is at the National Central University of Taiwan, and it is used by students and faculty to download anti-virus software.9 This is potentially a severe security problem, as the attackers may have substituted their malware for anti-virus software for use by students, employees, and faculty at the National Central University. The malware matches behaviour documented by ThreatExpert earlier this year.10 Documents with names such as “Urgent Appeal to Secretary Hillary Clinton.doc” and “Days with ITSN Tibet in My Eyes.doc” contained malware that connected to mmwbzhij.meibu.com on ports 8585 and 8686.
and [random file extension] can be any of the following: rm, mov, mp3, pdf. The domain names 3322.org and meibu.com are dynamic DNS services that allow the attackers to map domain names to IP addresses they control. In these cases, the attackers are not required to register domain names. Attackers typically favour dynamic DNS services such as these.12 The attackers have pointed these domains to IP’s on the networks of Black Oak Computers Inc, CA, USA, and C&M Communication Co., Ltd., Korea, in addition to the Taiwan Academic Network. The control servers on pc-officer.com have, in the past, resolved to IP addresses on One Eighty Networks, WA, USA, KIDC, Korea and HINET, Taiwan, in addition to the National Central University of Taiwan’s server where students and faculty download anti-virus software. In general, determining attribution in these types of attacks is difficult. Analyzing domain registration and other contextual information can occasionally provide some useful leads. It is unclear what the connection is here as “hetu.cn” is a domain registrar and hosting company. It is possible that the information is not connected to the attackers, but others who have been compromised by the attackers. Considering that the contact information of these assistants was not publicly known, but was known to China’s Foreign Ministry, an element of suspicion is raised concerning the involvement of the latter. However, there are alternative explanations for how the attackers were able to assemble the list of contacts. These attackers have been actively compromising targets since at least 2007, and likely compile lists of new targets from information acquired through previous exploits. In fact, the accuracy of the email used in this case, and the malicious attachment, suggest that the attackers leveraged information stolen from previously compromised computers. There is no evidence that directly implicates the government of China in these attacks. However, both the timing and targets of the attack do raise questions. With the 60th anniversary of the People’s Republic if China fast approaching, it is difficult to dismiss attacks on high profile media targets such as Reuters, the Straits Times, Dow Jones, Agence France Presse, and Ansa as random events. These organizations were targeted directly, but the motivation of the attackers remains unknown. Furthermore, the use of compromised servers at the National Central University of Taiwan and the Taiwan Academic Network will no doubt add to an already tense relationship between China and Taiwan. The Information Warfare Monitor (www.infowar-monitor.net) is an advanced research activity tracking the emergence of cyberspace as a strategic domain. The IWM is public-private venture between two Canadian institutions: the Citizen Lab at the Munk Centre for International Studies, University of Toronto and The SecDev Group, an operational think tank based in Ottawa (Canada). The Malware Lab (www.malwarelab.org) is an independent research collective comprised of volunteers that investigates and reports on politically motivated malware attacks, primarily against civil society organizations. The ML combines technical data with socio-political contextual analysis in order to better understand the capabilities and motivations of the attackers as well as the overall effects and broader implications of targeted attacks. Posted by Insider Information: An intrusion campaign targeting Chinese language news sites - The Citizen Lab on July 5th, 2017.